Welcome to the all new, redesigned Kprobe2! What follows is a brief tutorial on the use of Kprobe2. If you are familiar with Kprobe then you will see a number of new features, apart from the re-design. KProbe2 is much more user-frinedly, sleek and easy to use. We hope that everyone enjoys using it as much as we have. Kprobe2 is designed to work only with LiteOn DVD/CD burners. Any suggestions, bug reports or general discussion are encouraged in this thread. As before, Kprobe full install will look for ASPI and install it if none exists. However, you now have the option of using the SPTI driver instead of ASPI, and this will be discussed more later. KPRobe2 can co-exist with Kprobe1, you do not need to uninstall one in order to run the other. They will, by default, install to the same directory. 1: Added support for BlueRay discs and also Smartburn, HyperTuning and OverSpeed functions. 1: Fix DVD-R display bug with discs that have a mediaID longer than 10 Characters. Fix bug: ATIP/ADIP cannot stop when TE/FE occur on the last block. Before we go any farther, let’s not forget to look at one of KProbe2’s nifty tricks, just click on the disc icon in the upper left corner. There you see the option to minimize KProbe to the task tray. A very nice feature if you’re using the book-type tool and don’t need the program taking up space in the taskbar. Now let’s move over to the Info menu. These options will give you a wealth of information about your media and drive. As you can see, you have the option to copy disc info to your clipboard. This makes it very simple to post an error scan in the forum, you just paste this into your post and everyone will know what media you have scanned. Next on the menu is the “Supported Media” info. At present this only works with CDRW drives, so you will get a warning if you try to use it on a DVD writer. What it will show you is the list of supported media from your firmware. We hope that future firmware releases on the DVD writers will allow this feature to work. Next on the toolbar is the driver selection menu. 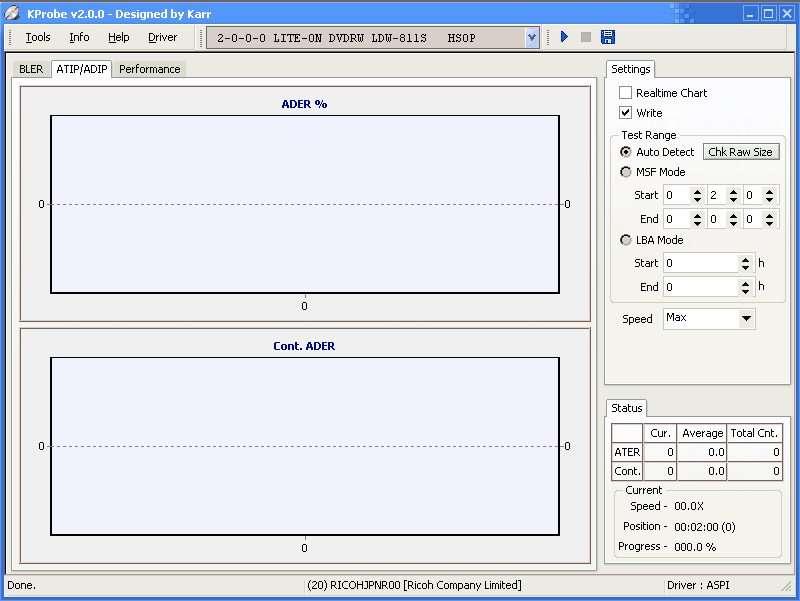 You can now select whether to run KProbe2 on the ASPI driver or SPTI driver. KProbe2 will remember your setting and run on that driver every time you use the program. If your system is having problems with the ASPI drivers, you now have the option to remove them completely. Some people report problems with SPTI drivers as well, so use what works the best for you. On the right side of the toolbar you will see the start-stop-save buttons. At the bottom of KProbe2 you now have a status bar that will display the status of your test, the media inserted in the drive, and the driver in use. RealTime Chart: Disabled by default, do not use this unless you have a speific reason for doing so. 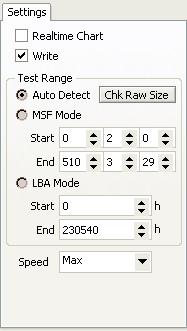 Maximum Sampling Rate: This option should be used to increase accuracy when your CPU power is limited. It is intended to minimize the program’s demand on the CPU so more sampling is done. For most systems with P4 or better CPU, this should never be required. Of course, Athlon based systems of any kind would be considered “better” than P4. Remove The Singular Point: This will clean up some of the high single spikes that some drives produce when scanning PI/PO. As I understand the fix, it removes any spikes where PI=PO and equals the max error count. It should reduce those spikes but not affect the over-all results. Test Range: These settings allow you to set whether to scan the entire disc or only a portion of it. Auto-detect is the default, and will scan the entire burned area of the disc. If you wish to know the actual size of the burned area, just click the “Check Size” button. Speed: This drop-down speed selection replaces the type-in speed command from the old KProbe. 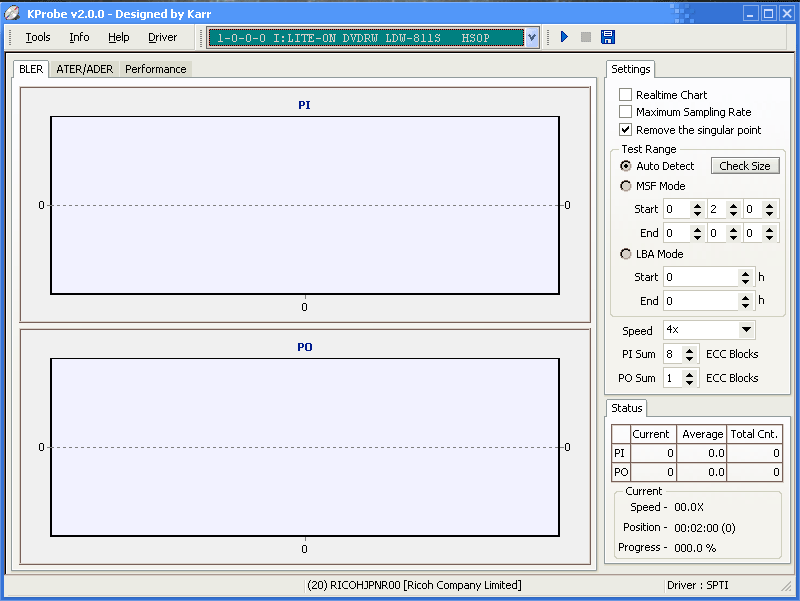 Your selected speed will become your default speed every time you run KProbe2, until you change drives or driver. ECC Sum settings: Note, this has changed! You now set PI and PO ECC counts separately. The default is 8 and 1, which conforms to the DVD standards for 1x scanning. There is no reason to change these settings. However, when comparing scans from KPRobe2 to scans from KProbe1, you must be aware that the PO count is different, and PO levels in KPRobe2 will be different, when compared to ECC-8 counting. Another way to express this difference is that we now are looking for PO counts under 4 max, instead of 32-max. My experience has been that actual differences will vary from disc to disc, and scan to scan. But the DVD standard at 1x scanning is 4 max PO. Dual Layer scanning: Kprobe2 is designed to perform scanning of both layers of dual-layer media. However, some drives may not support this function, so you may need to wait for your dual-layer LiteOn burner to do those tests. This provides real-time counts of errors, drive speed and test progress. 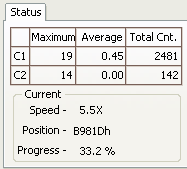 Always remember to check the actual scan speed here during your scan, rather than relying on the selcted speed. 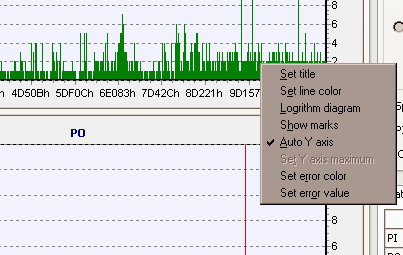 In case you haven’t seen the tool tip in the program already, you now make your graph settings by right-clicking on the graph. (only while the test is not running). Set Title: Allows you to create a custom title for your graph, which will be saved in your image file output as well. Set line color: Allows you to select the color for the graph you clicked on. Show Marks Click and you’ll see what it does. Auto Y axis This will auto-graph the chart to fit the error rate of the actual test results. Recommended to leave this checked and not use a fixed-sized graph. Set error color and value These set how a “read error” is displayed when scanning CDR/RW for C1/C2. Please note that these erors are not the same as C2, and are not “unreadable sectors”, but simply indicate that the PUH has skipped over that sector. This occurs either as a result of unreadable data (high C2), or as a result of PUH slipping. A few of these errors are normal on most drives. You may also have noticed that KProbe is now re-sizable! You can drag the window to any size that pleases you. Note that the size of your graph, when saved to an image file, will change proportionally when you change the window size. To stretch your graph and get a better look at it, just drag the window wider. This set of tests is not new, but has also not been used to date. It’s my hope that further discussions of these tests will follow, and we will learn to use this to further identify problems with hardware or media. To put it simply, this test helps identify problems with laser focus and servo accuracy. It tells us what percentage of bits are written to their correct address. In terms of results, lower is better. My source tells me that 8% ADER/ATER is considered too high. What this means is that 8% of your bits are not where they are supposed to be. The media is very much a part of this accuracy test, as is the burner. “Cont.ADER/ATER” is a more generalized running count of these errors. It tells you how many continuous errors have ocurred per block. Again, lower is better. Real-time Chart As before, unchecked by default, do not use this unless you have a specific reason to do so. Write:This will require a blank disc, and will write data to the entire disc then read it back and give you the results. This is the true measure of your burner’s performace in the ADER/ATER tests. 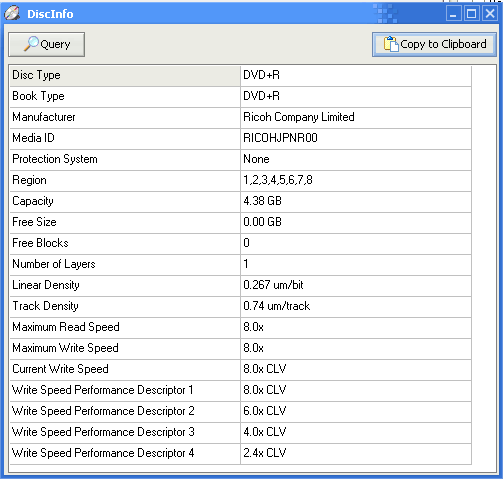 Un-checking this will alow you to read any disc and see how well it performs in the same test. The value of a read-only test is questionable. Again, this is a very simplified explanation of a fairly complex test which warrants a great deal more discussion. Feel free to ad your 2 cents. Here you have a nice collection of performance tests similar to what you have seen in other programs. You have the oprion to run a transfer rate test on your burned media. 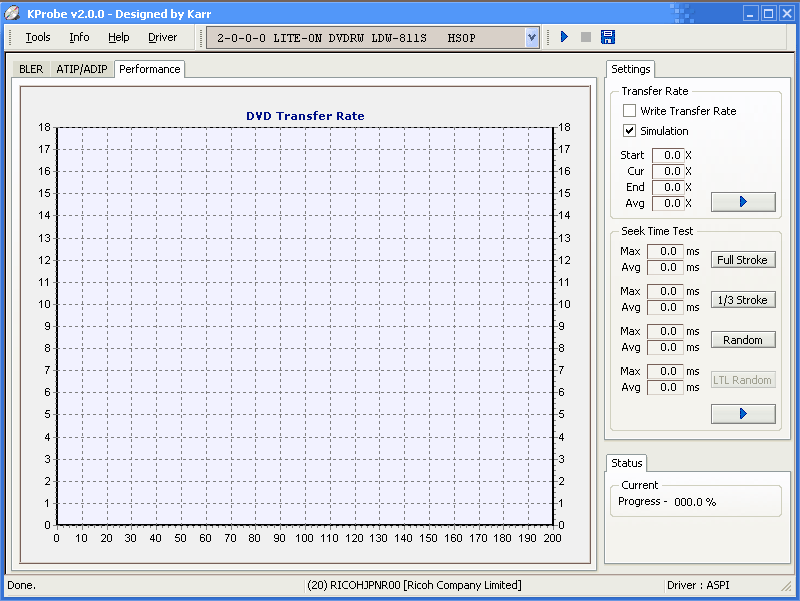 This test will be similar to what you see in CDSpeed, and the drive will slow down if there is trouble reading a disc. You also can choose to burn a data disc to test the burn rate, or simply simulate the burning by checking the appropriate boxes. 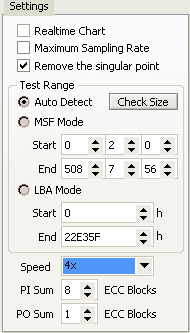 If you click the start button at the top of the window, KProbe2 will run all the tests. If you click one of the start arrows in the settings box, you will only run that test. Note that we now have a layer-to-layer seek test for dual-layer media. [b]That about sums up the new testing program. I hope I have managed to make a good introduction for those who are familiar with the old Kprobe, but also for those who are new to Kprobe. CDFreaks asks that you do not link to files on the CDFreaks servers, and we will be taking steps to prevent such rude behaviour. We welcome external links to this thread and forum. What does “Remove the singular point” do? One of the features of KP2 I like is the mouse-over help box… Read what it has to say about it. It’s supposed to fix a problem with PI/PO readings that results from a bug in the MediaTek chipset. It does not affect the C1/C2 spiking problem. I assume that is to correct those seemingly random high spikes we see once in a while? Remove The Singular Point: This will clean up some of the high single spike that some drives produce when scanning PI/PO. As I understand the fix, it removes any spikes where PI=PO and equals the max error count. It should reduce those spikes but not affect the over-all results. To have the PO count the same as in kprobe1 you would set the PO Sum to 8 or 4? If you scanned at ECC-8 in Kprobe, then setting PO at 8 in Kprobe2 would produce a comparable scan. Would this indicate nearly half of my bits are misplaced?.. but im still getting spikes…must only be a fix for certain drives or motherboards not the 812. That’s… very high… try scanning at 4x instead of max and see if that helps. BTW, rdgrimes, about this ADER discussion… should we fork this off into a new thread? I second what code65536 said, here a write ADER test from my 401@811 drive. A good test result is equally dependant on good media and good hardware. so the standard is <=280 for PI and <=5 for P0 correct? using PI sum of 8 and PO sum of 1. This time I let it write the disc. Yes, probably should start another thread for this. Also, rdgrimes should set up some specs for running these tests at so we can get some comparative results. If you start the thread I’ll post the result there. Cool tool to play around with… thank you rdgrimes. BTW, why do I get this error. [B]Cool tool to play around with… thank you rdgrimes. 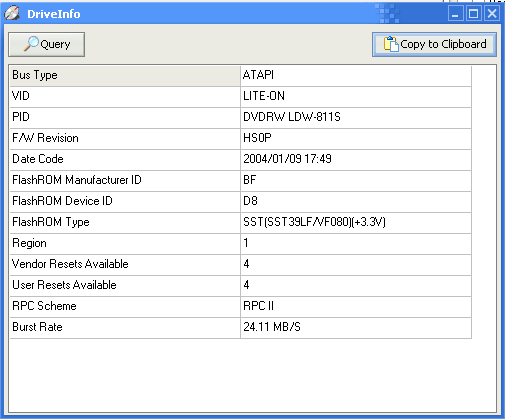 There is a bug in the current firmwares for Liteon DVD Burners. The bug is being looked into, but hasn’t been squashed yet. Attempting to see the supported media list on DVD Burners causes KProbe to hang, thus, it was disabled. You can try it out on CDRW and Combo drives though! It’s either the error message or a full-on system freeze and hard boot. Would you prefer the other? DVD writers have some as-yet unknown firmware bug that prevents the querie of the media library.